I am a watch nerd, and I'm happy with that. I'm a watch nerd because watches make me feel complete. When I put on a watch, wind it, set the time and spin my wrist so the watch fills the space in front of me like a full moon, joy runs through my veins. Being a nerd is being happy. I recently wrote about how collecting watches is a type of nerdism, but after publishing that article I'm willing to take this idea a step further: Grand Seiko collectors are the biggest watch nerds of all. Grand Seikos infuse collectors with an endorphin-like sensation more than most other brands, as if you're sitting inside a centuries-old Japanese shrine on an early spring morning, the melody of rustling leaves accompanying birds’ songs. Why does Grand Seiko make magic on our spirit, while other watch brands don't? I think it has something to do with the culture behind Seiko's special Zaratsu polishing, the purposeful journey Grand Seiko has taken over the past sixty years, the way Grand Seiko combines beauty and engineering without bragging about either, and the enchantment that lives in Japan and is embodied in each Grand Seiko. But the pleasure we get from Grand Seiko also has a lot to do with us, the community of Grand Seiko wearers, who are spiritual cousins. When you spot a Datejust or Speedmaster on somebody else's wrist, it's a shrug of the shoulders. But if you happen to see a Kiku, Whirlpool, Cookie, Glacier [add a link or two] or other Grand Seiko in line with you at Starbucks you feel like you've reunited with a friend after many years. A Grand Seiko is comfort food, because it can transform a dreary, dim day into a heart-stopping sunset that appears in the moments between when the rain ends and the sun dips below the horizon. Grand Seikos are natural beauties like Mt. Fuji, and natural athletes like Naomi Osaka. Excellence appears easy for Grand Seiko, even though we know the watch company's achievements took decades, through trials and failures as impenetrable as a remote forest. Grand Seikos are machines, but they are born from the natural world. The lacquer used in Grand Seiko's Elegance Collection comes from tree sap from Iwate prefecture. The dial of the Grand Seiko Spring Drive SBGA011, the Snowflake, so perfectly resembles a field blanketed with fresh snow you feel that snow was made to look like this watch, rather than the other way around. Grand Seiko's SBGM235 was nicknamed "Kiku," 菊, the Japanese word for chrysanthemum, because the dial and that flower are inseparable. The Grand Seiko you wrap around your wrist today has more in common with the first, 1960 Grand Seiko than it has differences. Even after decades --generations in watch years-- Grand Seikos maintain a powerful family resemblance. 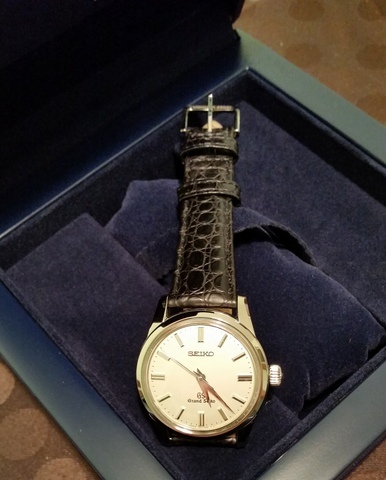 It's comforting to know your just-bought Grand Seiko is the progeny of all the Grand Seikos that have come before. It's like seeing yourself in a portrait of your great-great grandfather. Grand Seiko wearers are washed in the calm that comes from being a part of a family, from being able to trace our current watch's lineage back in time to the beginning. Grand Seiko nerds are perpetual children, enjoying each new Grand Seiko as a wondrous adventure. We’re looking out our windows on Christmas Eve, spotting Santa and his reindeer high in the sky, even when no other kids see them. 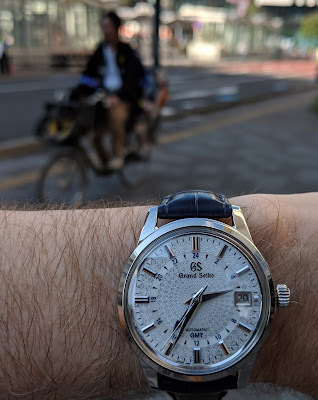 Being a Grand Seiko nerd is a delightful condition, better than cold ice cream on a scorching August day or waking up at 7 a.m., thinking it's Friday, but, after a few seconds, realizing it's Saturday. 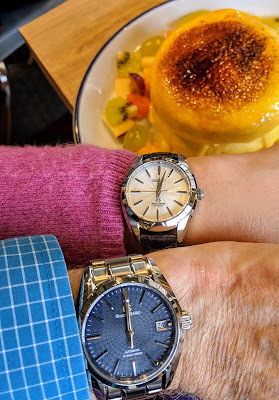 When you're a Grand Seiko nerd you're a member of a proud, happy, nerdy family.